This past Father’s Day, Fiona and David took me to a matinee of Jurassic World. We’d shown David the first three films earlier this year, and he was pretty psyched to see it. I wasn’t expecting that much, but hey, dinosaurs on the big screen, right? I wound up being pleasantly surprised. 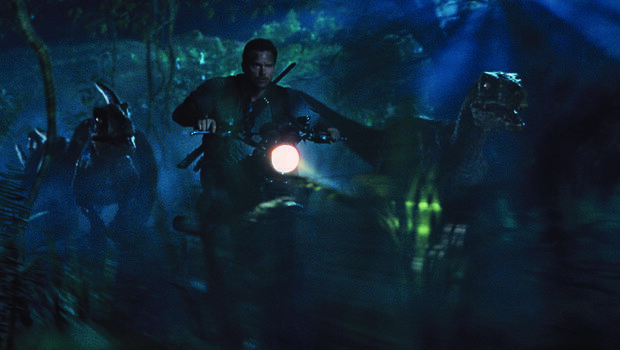 Like the original Jurassic Park, this film is a Frankenstein narrative, which is to say, a story of overreaching. In order to boost attendance at the Jurassic World theme park, the park’s administrators commission the creation of a hybrid dinosaur, which turns out to be far beyond their ability to control. It escapes, and sets tumbling the chain of dominoes that is the rest of the park. In the process, we get references to the first three movies, as well as to other films such as Aliens and the original Godzilla films. The film climaxes with a multi-dinosaur brawl that’s over the top ridiculous and thrilling, and that had my inner twelve year old cheering. There are a few inconsistencies in the film’s narration that could have been taken care of with a couple of minutes’ dialogue; at the very least, I think the story would have benefited from an explanation of how the theme park was opened after the disasters shown in the earlier films. The film also puts in place elements for a potential sequel; although that could wind up being a very different, and very interesting, movie, should it head in the direction I think it will. David declared the film, “Awesome!” We give it four raptors. So the Honey Badger came over last night to watch a movie. I had a copy of Joe Johnston’s 2010 remake of The Wolfman, which I’d picked up in the discount bin at Wal-Mart some time ago. I’ve been meaning to give the film a look since I bought it, but it wasn’t until a passing comment online by the talented David Nickle the other week that I thought it might be time for settle down and watch it. We popped it into the Blu Ray player, selected the unrated version, and off we went. What we were treated to was a highly entertaining, fairly-traditional re-vision of the Wolfman narrative first shown in the 1941 film with Lon Chaney (although there are nods to more recent werewolf narratives, too, such as An American Werewolf In London). All of the leads–Benicio Del Toro, Emily Blunt, and Anthony Hopkins–took a little while to win me over, but by the end of the film, they had. The movie does an especially good job at bringing to the fore and running with the Oedipal issues that swirl about the earlier film. There are a number of wonderful set pieces, including a transformation from man to monster within a late nineteenth century medical amphitheater, and the werewolf running amok in a gypsy camp and in central London. 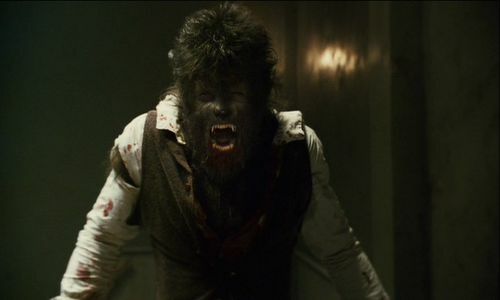 Most interestingly to me, the movie never forgets that the werewolf is a monster. It’s not the emblem for Team Jacob; it’s an avatar of our worst, most violent tendencies. It’s a real shame this movie didn’t do better at the box office: it’s what an old-fashioned monster movie is supposed to be, I think. If you’re willing to show a little patience, I think you’ll be pleasantly surprised. This last will be an original novella which is looking to top out somewhere around 30,000 words. It’s about a woman hunting a succubus. My gratitude to my agent, Ginger Clark, for her usual diligence in handling the contract negotiations, and to Derrick Hussey of Hippocampus, for being willing to work with me again. There’s no pre-order listing for the book, yet, but rest assured, I’ll let you know when there is. So the Honey Badger’s been dying to see this movie since it came out, and I’ve been promising I would accompany him. Well, today I finally honored that promise, and boy, was it worth it. In a sense, there’s not much to Mad Max: Fury Road. It’s more or less a two hour chase-movie, with a couple of moments for you to catch your breath in. What there is, though, is a world more fleshed out in its post-apocalyptic, wide-screen, operatic insanity than any of the previous Mad Max films, as well as a roster of incredibly well-acted parts. About midway through the movie, I found myself thinking, “No matter how this film ends, it’s already brilliant.” It’s to the film’s credit that it manages to arrive at an ending that’s satisfying because it’s earned. A lot of the reviews of/commentary on the film have praised its heavy use of practical effects over cgi, but I’m more impressed with the attention paid to its characters. I don’t know if I’ll make it back to the theater to see this again, but I’d really, really like to. In the Mouth of–Oh Wait.